This is a German 76.2cm brass case for captured Russian gun named PAK 36R by the Germans who made there own ammunition for these guns and this is one of the cases which is German made.This case is in nice solid condition for a relic but the brass has corroded after 70 years on lake bed some of its original markings which can be seen but not perfectly clear the case was recovered in early 2016 from a lake in the Falaise gap area of Normandy. A very nice relic only recently found from the famous Normandy battlefield in the summer of 1944. 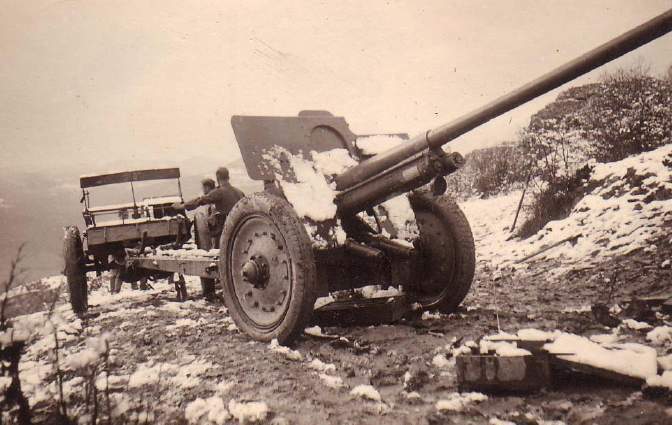 The 7.62 cm FK 36(r) and Pak 36(r) (7.62 cm Feldkanone (Field gun)/36 (russisch) and Panzerabwehrkanone (Anti-tank gun) 36(russisch)) were German anti-tank guns used by the Wehrmacht in World War II. The first guns were conversions of the Soviet 76-mm divisional gun M1936 (F-22). Later in the war, the Soviet USV and ZiS-3 76 mm divisional guns were also converted.